The traditional Shaker style has remained in demand for so long that calling it “traditional” hardly seems right. Rather, its simple beauty and elegant design remain fresh year after year, decade after decade, providing a constant way to shake things up at home and bring new life into the home. Simple elegance with a touch of “down-home style” mark the Shaker Wine Hoosier Hutch. 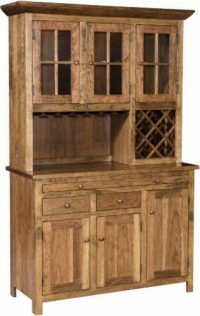 The Shaker Wine Hoosier Hutch, pictured here, boasts the classic Shaker style that has charmed people for over a century and features striking two-tone construction. With traces of the “country style”, this Hoosier hutch beautifully-blends elegance and down-home design. A charming wine rack and stemware rack, touch lighting and wood mullions accent this piece. While a pull-out serving tray serves a practical function. This piece is also available with a huge selection of custom options! Be sure to check out more dining hutches at Brandenberry Amish Furniture and see why Amish-crafted furniture is something special!